Before you begin: Have the whipping cream at room temperature. Pour ½ pint whipping cream into a 1 pint container with a tight-fitting lid. Add salt at this point if you wish (approximately a half teaspoon). SHAKE container VIGOROUSLY!!! After about 10 minutes or so, the cream will be whipped—this is NOT butter! Continue shaking and after another minute or so, lumps of butter will form and you should see liquid (Buttermilk) in the container. You will know you have butter when the milk (buttermilk) separates from the fat (butter). 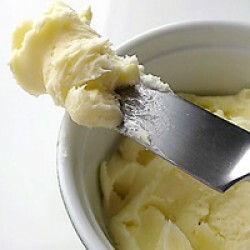 Serving suggestions: Enjoy your freshly made butter on bread, pancakes, muffins, veggies . . . or whatever you wish!